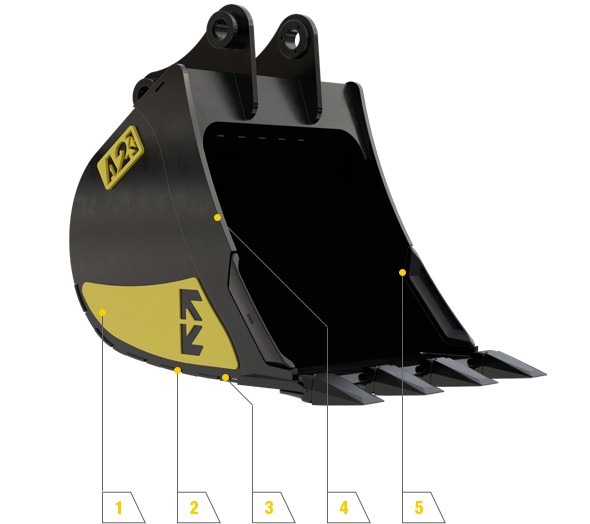 The A2 digging buckets are designed to improve the efficiency of your machines. Suited to a wide range of tasks and coming in a variety of widths, these buckets can be used with a normal coupler or a tilting coupler. Whatever the application, these buckets are sure to perform for you. These strengthen and extend the life of your bucket. These reduce the wear to the base of your bucket and help strengthen it against damage and caving in. This is to allow the bucket to cut the ground at the same angle as the crowd action, allowing it to fill easier and stop the bucket striking the ground at the back. 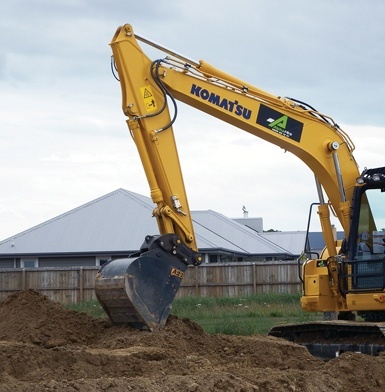 This is to help while digging at a tilted angle by reducing ground contact. Side cutters are included to ensure a cleaner cut while also reducing wear to the side plates. A slipper plate welded onto the teeth. Designed with a double radius curve to ensure it cuts through the earth smoothly without striking the ground with the bottom of the bucket. Using BIS400 in the wear strips means higher wear properties increasing the life of your bucket. * Achieved through using machined pins to suit smaller diameters. Specifications are subject to change without notice. Not the right bucket for your needs?